As many Virginians involved in politics, I received an invitation to the inauguration of Ralph Northam a few weeks ago. It was addressed to me. But in hindsight, I see that the weekend of celebrating a win for Northam was not really intended for a gal like me. After having almost two weeks to ponder these mysteries, let me tell you why. No matter what demographic, everyone loves a celebration. And no matter how you identify, most folks I know love a good party. So maybe the Democratic Party of Virginia (DPVA) did think of me, with their “message” of welcoming all. Perhaps, I was just being jaded, so I planned my weekend accordingly. Right away, I wasn’t thrilled about being outside; tons of people, and a speech that was emblematic of Northam not including words such as “Black”, “African American” or “People of Color”. Simply speaking of a “unique” history when referring to the organized genocide and treasonous acts against our African ancestors is not enough in the former Capital of the Confederacy. Maintaining this traditional white-washed, colorblind, political speech repeatedly fails to recognize the lives that are continuing to be lost due to the systemic oppression the Civil War and slave trade historically caused. Knowing this was Northam’s MO, I decided to skip the ceremony. After the inauguration was the ball, I considered going for the Princess Tiana style (“The Princess and the Frog”), and represent the first black royalty of Disney. As with any princess story, I would want a plus one, so two tickets for the ball please: that’ll be a total of $500. Wypipo translation: Wait a minute. To someone in my demographic, this seems like a problem. 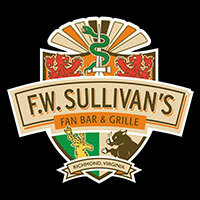 There are many establishments, events, and even zip codes I know are not for me; so why does the most distinguished inauguration event translate to the most expensive and the most inaccessible to the true progressive base – the same one that ushered in a Northam victory. If Virginia is aiming to move away from toxic politics, shouldn’t our top Democrats have to display the courage to refuse the influence poison that travels from their pockets to our policy? As I continued to look at inaugural events I continued to notice ticket prices that cost $50 and up. The Metro Richmond Young Democrats (MRAYD) were hosting their second annual Millennial Toast and that was only $35. You know, a price that addresses the millennial economic reality… thanks, guys. I was gifted a ticket to the First Lady’s Brunch from a local advocate, who knows what that ticket would have cost had I bought it. I’m a policy junkie, not a fashionista, therefore I’ve run out of items to wear to these political events and had to purchase a $35 dress and new tights that won’t run and will keep me warm – another $10. The separation between how I see my total spend of $80 on inaugural events versus something even higher now has to also be viewed through the lens of class. I can see $80 as difficult, but to some, it is impossible. Yet to the inauguration committee, their audience would not have thought twice over an $80 or higher weekend of events. Which asks the next question. Why shouldn’t I have been the intended audience for the entire weekend inauguration celebration? 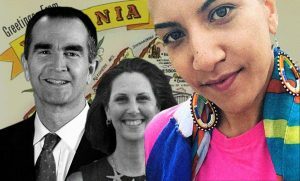 Black women, young people, and the progressive coalition ensured Northam’s victory. Was he the best Democratic candidate? Debatable. But we vote for survival in today’s political climate – more on this later. Nonetheless, I got to participate without having to withstand the frigid cold of his swearing in. Speaking of the cold, how are those Richmond public housing residents who still don’t have heat? This stinging sense of irony was not lost on me, after just touring the freezing homes of our low-income residents who were less than a mile away from the inaugural ceremonies. That fact that the only free celebratory event put on by the inauguration – was also outside – in the cold – was not lost on me. Low-income Virginia voters were obviously not the intended audience for such a weekend based on the cost of tickets. But, I’ll ask again. What about me? I’m a person of color. I’m middle class. I’m an entrepreneur. I’m a master of clinical social work. I’m a cis-het female. I’m a millennial. I’m a mother and I’m a registered voter. In these political situations, I usually identify as a black woman first. 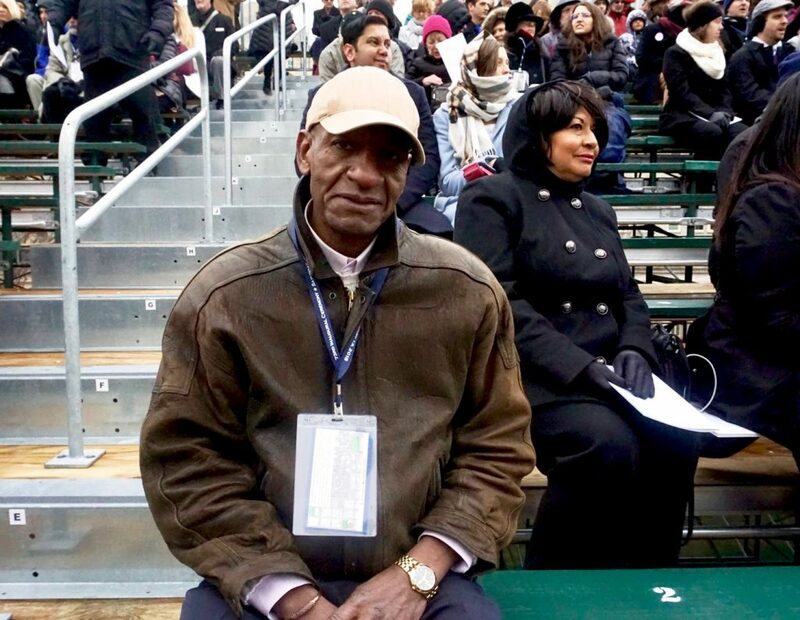 But I noticed within the black folks in attendance, it was my lack of discretionary income that kept me feeling like an outsider; it was my economic class. And just like that, it hit me. My anxiety triggered because I know the complications that can come from balancing intersecting needs in politics, such as race and class. I recognize it from the 2017 campaign trail when the Democrats said Northam would make 2018 the year of women. As I supported his campaign, I was still yelling for the word “black” to be added as a prefix to my womanhood. “Say Black Women Ralph!,” but per usual, I did not feel fully represented. The time it would take to include the words “women of color” would only be a few seconds, but the addition to his support would be exponential. This was something also on display at the First Lady’s Brunch at – you guessed it – the Jefferson Hotel where the average weekend stay is $285 per night. Angela Patton is the CEO for Girls for Change, which is a non-profit that provides programming for inspiring vision within black girls and other girls of color. She gave an amazing introduction to the brunch and when she said, ‘Girls for a Change, starts with the most powerful and wasted resource on the planet- girls,’ everyone erupted in cheers and applause. She then added, “specifically girls of color,” and surprisingly to me, I was the only person to clap raucously. The crowd, in typical awkwardness, joined me in applauding, but the message was clear. The words “girls of color” were not valued in a speech within the context of this audience. This was further validated as race, ethnicity, or any recognition of color was never spoken about during the rest of the event – not even by the First Lady as she spoke about children in need. After the brunch, I asked the First Lady why she didn’t use the words “black”, “brown”, or “of color”. Her response included a three-course meal of political doublespeak. The appetizer was the line of needing more “studies” to see who was actually in need, the entrée was a very large portion of “concern” for not wanting to use words that label people, and finally, for dessert, a slice of how such words can be “divisive”. I looked around in confusion upon hearing Pam Northam’s words. I had to make sure that I hadn’t stumbled into a Republican event given this is their talking point. The First Lady had said this to me with such ease, not appearing to realize the disconnect of inviting Girls for a Change to be the face of her event, while at the same time, not using her platform to recognize them fully in her words. This took me back to my experiences with her husband on the campaign trail and attempting to be seen and heard as a woman of color. Luckily, I have interacted with Governor Northam during the campaign trail and have witnessed a genuine desire to listen to his constituents. Now it is the voters turn to wait and listen to the messages being sent in words and policy, as well as the non-verbal messages, such as pricing for these inaugural events. We must protect those still experiencing intersectional oppression in Virginia, while at the same time, advocating around economic injustices. The themes being sent by Virginia’s new administration are quiet in nature, but heavy in impact. The price points during the inaugural weekend sent a message that those with political influence or those with enough money to have influence are the ones who should be appreciated or celebrated. The lack of color in Northam’s speeches sends the message that his policies will lack equity to address historically disenfranchised communities. Yet in this political climate, it is up to us to assess, recognize, and call out these messages to protect justice for all of us. Uncovering toxic politics allows us to recognize when a three-letter word like “all” has been historic in dividing us while leading with the illusion of inclusivity. All men are created equal, All lives matter; Virginians should no longer trust the word “all” from any politician without specific intersections being addressed. That way the community can in unison say we are excited about #TheWayAhead, but we must first demand that there be #OneVA as well. 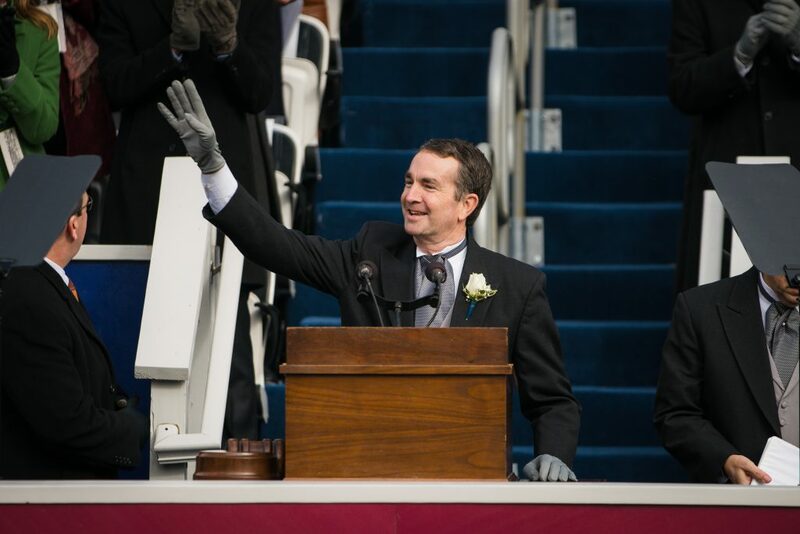 Ralph S. Northam was sworn in as the 73rd governor of Virginia just as the sun broke from an overcast sky on Saturday at the state Capitol. Northam promised to work for all Virginians, invoking the Virginia Way stump speech he used throughout the campaign, and provided a clear rebuke to the divisive Trumpian worldview his GOP opponent Ed Gillespie adopted late in the campaign. The governor, who attended Virginia Military Institute, opened his inaugural address by thanking veterans for their service and praising the peaceful transition of power before invoking the complex legacy of Virginia. “Our first governor understood liberty,” he said, referencing Patrick Henry’s “Give Me Liberty Or Give Me Death” speech, but he noted that just beneath the church where Henry made his declaration was one of the largest slave markets in the nation. After thanking outgoing governor Terry McAuliffe and praising his work, the new governor told stories from his childhood on the Eastern Shore, highlighting the values he said he learned from his mother and father: honesty, humility, and a lifetime of service to others, before quoting the VMI honor code. “‘A Cadet will not lie, cheat, steal, nor tolerate those who do.’ Virginia and this country need that now more than ever,” he said, drawing heavy applause. He would return to the theme of truthfulness and lies throughout his address. Northam outlined a slate of policy goals including medicaid expansion, insurance for all, blue collar economic development, addressing opioids, and tightening the permit process to reduce gun violence. “It’s easier to get a gun than it is to rent a car,” he said. Near the end of the speech, he also addressed discrimination, public school infrastructure, clean air and water, and rural poverty, before closing remarks. “This country is once again looking to Virginia to lead the way,” he said, referencing the national focus on Virginia as Democrats and Republicans prepare for November elections. Lt. Gov. 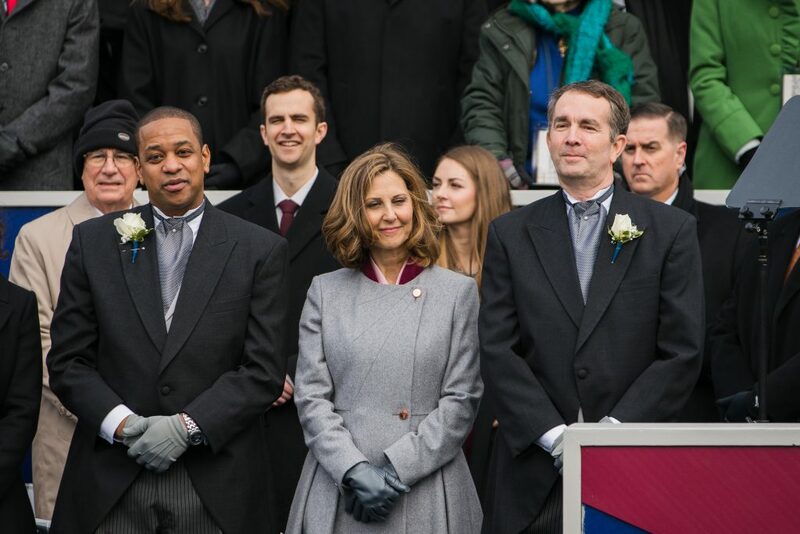 Justin Fairfax and Attorney General Mark Herring were also sworn in, providing for a second term of Democratic control in a commonwealth that tilted red for more than 20 years. Other attendees included Senators Mark Warner and Tim Kaine, members of Congress, and every living former governor. The ceremony was heavy on gospel music and diversity, starting with the opening performance of “America the Beautiful” sung by Larry Bland and the Volunteer Choir, a nationally-known gospel group formed out of the civil rights movement, to a blessing of the ground by representatives of Virginia’s Native American tribes with a traditional ceremony. 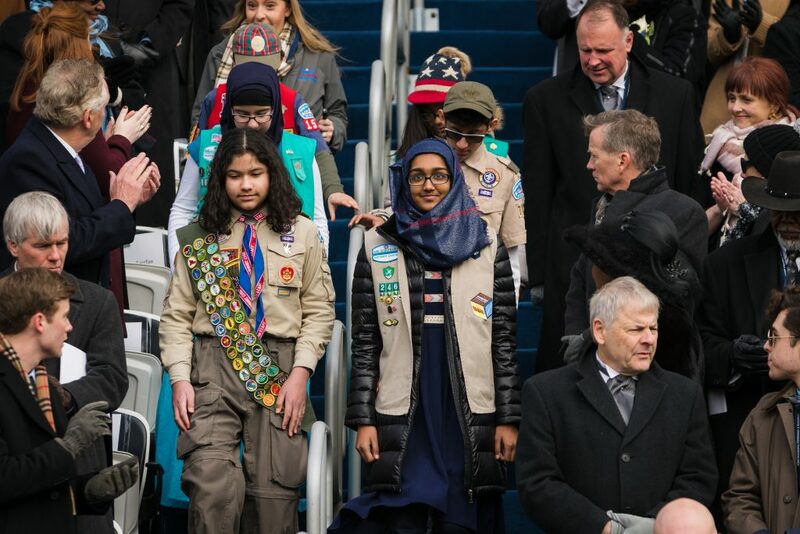 The inaugural committee also invited the Boy and Girl Scouts from the All Dulles Area Muslim Society Center to lead the Pledge of Allegiance and had a benediction by Rabbi Michael Knopf of Temple Beth-El, Richmond. The groups and individuals chosen to participate reflected the theme of diversity and inclusiveness Northam focused his speech on. 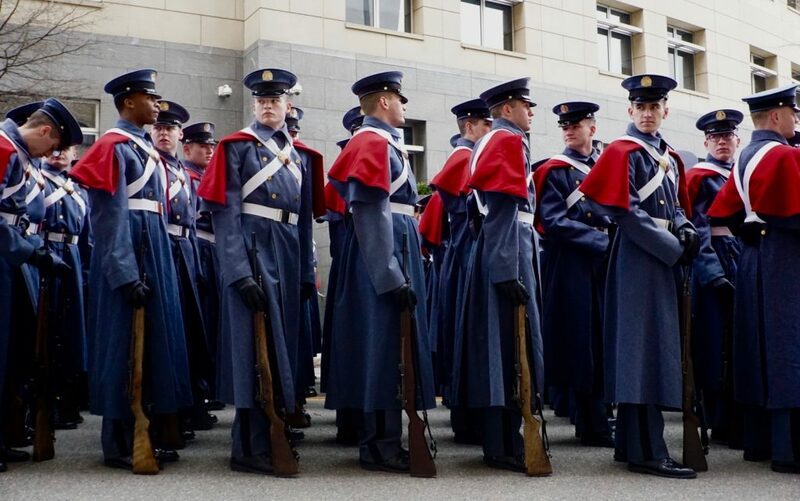 Some 4,000 were in attendance at the ceremony, which ended with a parade led by members of the National Guard, followed by the Virginia Military Institute Corps of Cadets. Other military-affiliated parade participants included Semper K9 and the assistance dogs they train for veterans, but other groups highlighted different aspects of the state. Pro-LGBT groups like Equality Virginia and Hampton Roads Pride marched together, while universities like James Madison University fielded marching bands, and the University of Virginia Chinese Lions dance troupe represented their schools. Employees of NASA represented the organization in astronaut garb and with model rockets, followed by Deborah Pratt, an 8-time state oyster shucker champion, before the Chesapeake Bay Foundation, a group that advocates for clean water in the bay. Dream Act supporters from United We Dream were also present outside, wearing brightly-colored orange hats, protesting the deportations of young people brought to this country without paperwork. 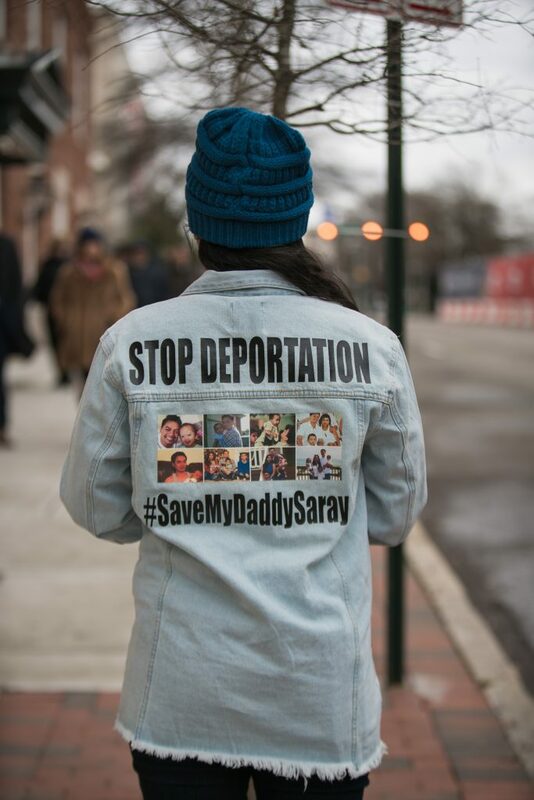 Among them was Sophin Sok and her cousin Samantha Oeur, who attended to tell people about Sok’s fiance, a young man who was brought here from Cambodia as a 1 year old and recently detained because of a minor arrest a decade ago. Inside the mansion, Northam signed three executive orders, the first prohibiting discrimination in state employment on the basis of sexual orientation or gender identity, the second enumerating the powers and responsibilities of his chief of staff Clark Mercer, and the third empowering him to declare a state of emergency. 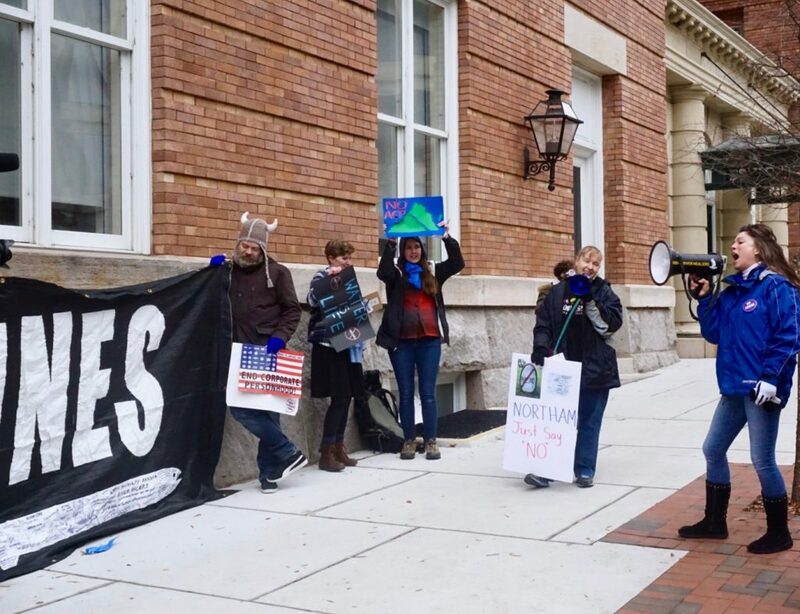 The first act continued the one signed by McAuliffe, which restored protections first established by Governor Warner in 2005, continued by Governor Kaine, and lapsed under Governor McDonnell. On hand to accept the pen was James Parrish of Equality Virginia, a statewide organization that seeks equality for LGBT Virginians. Cover photo by Branden Wilson (BW), other photos Wilson or Allison MacEwen (AM). Video by Alexandra Sosik. Allison MacEwen contributed to this report.